Many organizations face challenges using Microsoft Azure in a controlled way. The high number of services (and still increasing) and the scale of Microsoft Azure may make it pretty overwhelming to maintain control and enforce compliance on IT governance also known as company policy. How great would it be if organizations can enforce their IT governance to Microsoft Azure? Azure Policy allows IT organizations to enforce compliance on Azure resources used. Once a Policy is applied it can report compliance on existing Azure resources and it will be enforced on newly created ones. A full overview of Azure Policy is available at https://docs.microsoft.com/en-us/azure/azure-policy/azure-policy-introduction. For my own subscription I use for testing purposes only, I enforced a single Policy that defines which Azure location I am allowed to use. In my case, the location is West Europe which is more or less around the corner for me. 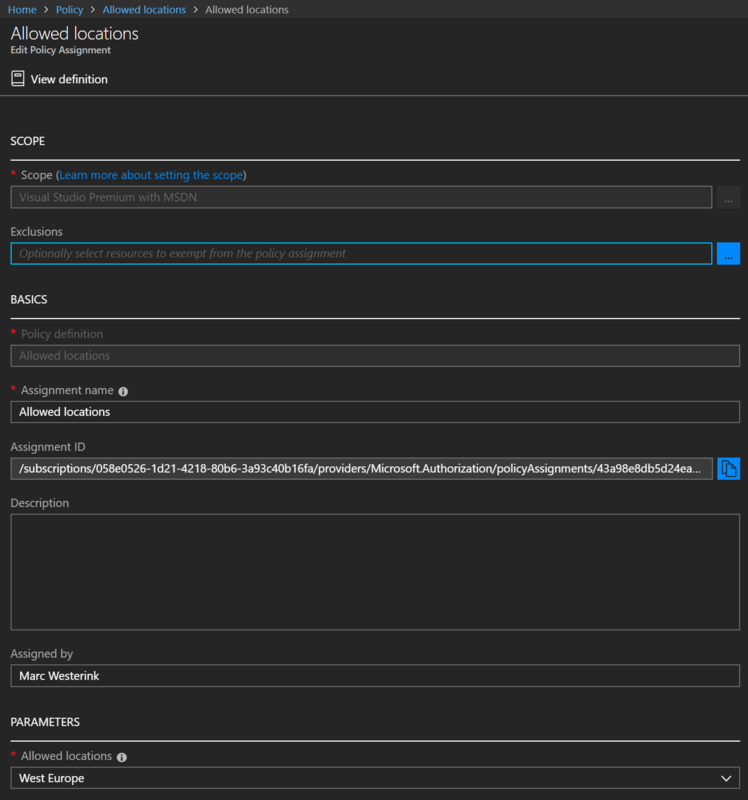 Adding Azure resources to a different location after applying it result in an error message. The screenshot below displays my configuration for this Policy. Before applying this policy, I’d strongly recommend to investigate IT governance if available. Once it is in place, then you should be able to ‘translate’ them into Azure Policy.